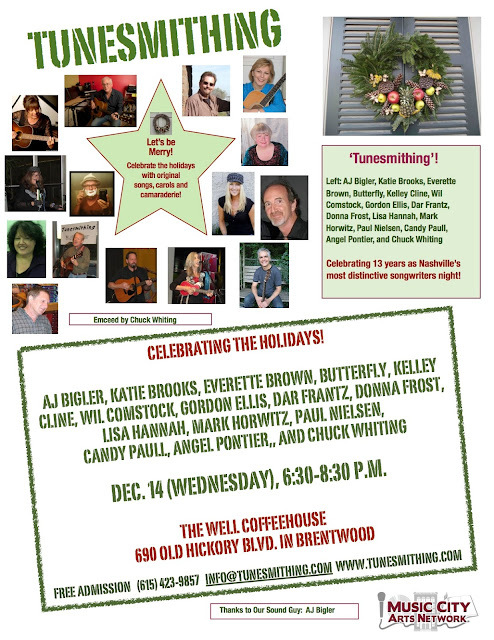 NASHVILLE, Tenn. (December 2016) -- "Tunesmithing" will celebrate the holiday season with a special show from 6:30-8:30 p.m. Dec. 14 (Wednesday) at The Well Coffeehouse, 690 Old Hickory Blvd. in Brentwood. Attendees will enjoy original and classic holiday songs and/or stories by AJ Bigler, Katie Brooks, Everette Brown, Butterfly, Kelley Cline, Wil Comstock, Gordon Ellis, Dar Frantz, Donna Frost, Lisa Hannah, Mark Horwitz, Paul Nielsen, Candy Paull, Angel Pontier, and Chuck Whiting. Admission is free. Food and beverages will be available for purchase. Publicist Chuck Whiting will emcee the show. Songwriter/audio engineer AJ Bigler will handle sound. "Tunesmithing" songwriters showcase is sponsored by Music City Arts Network and Shine Time Books and Music. The monthly show was founded in 2003 to spotlight emerging, professional and hit songwriters, as well as artists of all kinds. The event offers mentoring, career growth and networking opportunities for artists at all levels.